SuperBot 2018 is just a few days away! Before the excitement begins, we want to get to know one of our panelists, Bree Glaeser. Tell us about yourself. What should Superbot attendees know about your background? I am a creative strategist with expertise in designing for voice experiences. I have a unique background in design, research, and strategy. Currently, my focus is on the intersection of voice and commerce and human-centric design. I’ve worked for The Mars Agency for just about 3 years; initially in research and strategy for their sister company, The Strategy Shop, before moving over to the innovation team at Mars, to explore how new technologies are changing the shopping landscape. We saw that The Mars Agency recently launched, what you believe to be, the industry’s first voice-powered in-store shopping tool. Can you tell us more about that? As part of our SmartAisle technology development and ongoing efforts to explore how voice-enabled shopping will impact consumer behaviors and purchase decisions, we recently launched the Bottle Genius Powered by SmartAisle℠ skill for Alexa. We believe it’s the world’s first voice-powered shopping tool in the brick and mortar environment, and it’s currently helping customers make confident whiskey choices at NYC’s Bottlerocket Wine & Spirit. In fact, for the month of February 2018, YOY sales increased by 14% for the 120 whiskies featured on the Bottle Genius shelf set. This is just the beginning and a great example of how Voice is poised to change the way consumers shop. What prompted The Mars Agency to dive into frontier technology platforms to create custom solutions like Bottle Genius/Smart Aisle? We have a dedicated Innovation Lab for which the sole charge is to leverage emerging technology to make retail and shopping experiences better. We began investigating retail applications for voice assistance as it became increasingly present in consumer homes. As we watch the commerce landscape change, we’re paying special attention to the shifts in shopper behaviors and expectations, so that we are always able to help our clients meet those shoppers wherever they are. Mars has a long history of innovation in marketing to shoppers, and because we are still independently owned and operated after 45 years, we have the agility to invest in frontier technology platforms, and in fact a history of doing so. Several startups have come out of Mars in the last 25 years (Triad Retail Media, Prize Logic, Collective Bias, to name a few), and we even operated a small, sidecar venture capital firm for a few years that invested in early stage marketing tech companies. Do you see the potential for SmartAisle to adapt to other types of retail? If so, are there any new projects you can share with us? Absolutely! SmartAisle makes sense anywhere shoppers have to make purchase decisions. We’re helping customers eliminate the research step of their shopping journey, and instead conduct it live at a shelf in a matter of minutes, rather than at home or on their mobile phones. SmartAisle, in its current form, is particularly suited for more opaque categories, or categories where trying something new is common. We’re starting to have conversations with mass retailers across CPG categories including beauty, health and wellness and home improvement. Do you see any other ways that voice will continue to innovate and transform the retail space? We’re of the opinion that voice is truly the interface of the future. We think it will trump mobile as the preferred mode or interface for shoppers within the next five years. As technology advances there will be few things voice can’t integrate into — we imagine a role for voice at every stage of the consumer’s path to purchase, from adding to your shopping list in the car on the way to the store to re-ordering products through voice-enabled packaging, all of it is on the table right now. 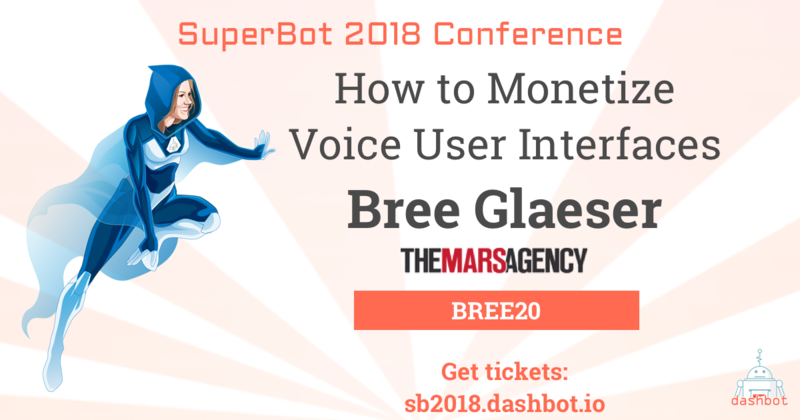 Bree will be speaking on the Monetization Strategies for Chatbots and Voice panel. You can see her and several other amazing panels on April 3rd at SuperBot 2018!